That is a good idea Mike. Would it be possible to do a print ruler for H0, 87% of scale for 00 (3.5mm to the foot).I have just printed out the Railway Hotel and St Cuthberts church. I now have to find the space on the layout where to put them! Measuring the 87% prints it appears 25mm 00 would be 22mm H0, 50mm would be 44mm, and 100mm would be 87mm. Would it be possible to include the windows on pages 1, 2, 3, 4, & 8 of the Railway Hotel as an acetate sheet similar to the windows layout on St Cuthberts Church? Also do you have a link to photos of the construction of the Railway Hotel? Also have you had any more thoughts on a fast food restaurant? A multi-national would be good, or would there be copyright issues using multi-national logos. Just a thought. Last edited by ianb26 on Sun Aug 19, 2018 4:11 am, edited 1 time in total. Wimpy would be a good one as it covers so many time scales. Just found your site, these are very cool. Looki g firward to printing a few out for a go! I'm having trouble discerning the thickness of the 300 gsm cardstock in mm. I have googled it but that has multiple answers that don't all agree, so I am none the wiser. Also this applies in reverse, what is the gsm for 1mm & 2mm card. What is the thickness you use for the 300gsm card stock? Conversely what is the gsm of the 1mm & 2mm card you use? A definitive answer will help a lot. I have built quite a few of your kits, but I think I should have used thicker or thinner stock on most of them. I have downloaded and built your Diesel fueling point and am really impressed with the result. The detail in the kit is so amazing and the accessories are included as well. I particularly like the fact that so little is required to weather the kit, just a couple of hoses for the pumps and a filling hatch and an air vent for the tank is all the unit needs to go on to my son's layout. A big thumbs up and thanks for the trouble you've taken although from the amount of kits on your site I detect that you enjoy your work Mike. To answer thh question above, 1mm board is the equivilent to 3 inches and 2mm board is 6 inches in OO scale, 300 gram card is the weight of card by the square metre hence GSM as aroun 3 sheets makes somewhere close to a millimetre the eath sheet would be a scale inch. The GSM weight of a sheet material tells you very little about its thickness or stiffness. It's useful to know that 16 sheets of A4 is a square metre. So putting 16 A4 sheets on the post scales will tell you the GSM for a sample. 300gsm greyboard (the stuff cornflake packets are made of) is going to be considerably thicker but nowhere as stiff as 300gsm bright white business cardstock. If you have an "Office Depot" or even better a "Hobbycraft" browse their stock, unless you have a small independent office/craft supplies shop, in which case use them for everything you can. You might pay a little more but often they will split packs. For example if you want one or two sheets of OHP transparency they often have an already split pack from copying to transparency for a customer, the best price will be online, but you'll have to buy a pack of 20 or more. Support them or they'll start disappearing as fast as model shops. Bufferstop wrote: The GSM weight of a sheet material tells you very little about its thickness or stiffness. It's useful to know that 16 sheets of A4 is a square metre. So putting 16 A4 sheets on the post scales will tell you the GSM for a sample. 300gsm greyboard (the stuff cornflake packets are made of) is going to be considerably thicker but nowhere as stiff as 300gsm bright white business cardstock. I only want to know the thickness of 1 sheet/piece of cardstock for 300gsm in mm and the equivalent of 1mm cardstock in gsm. Likewise 2mm in gsm. I currently have a sheet of cardstock 510 x 760mm and the weight is showing as 1100 gsm, and the thickness is about 2.2mm. I also have a partly used sheet at about 1.14mm in thickness, but unfortunately the label is not on the offcut so I don't know the original size or gsm of it. The qualities of paper and card are either rather subjective, or so complex that you need a laboratory to understand them, this is why it's far better to buy from a retail outlet, specifications can be very misleading. Our print room was run by an old guy who would pick up a sheet of card, flip it like a wobble board, run his fingers along the edges, lick them and do it again then pronounce. It to be OK for the task or tell you it'll be useless. His success rate was 99% or better, but he could never teach anyone else how to do it. It depends on the card type and the manufacturer. The best way would be to use a vernier and measure the piece you have, or stack up 20 and measure the thickness with a metal rule and divide the answer by 20! Morning all you card kit builders everywhere. Well I see we've had some discussions regards card stock, I have to admitt I must have been very nieve regards card / papeer size / weights / thickness. You would think in a modern society we would be pretty much all using a standard, sadly this is not the case & I've had quite a few emails from card kit beginners from the USA & Canada where the term A4 is not used. I'll try & inlcude paper size in dimensions which may help builders outside the UK. 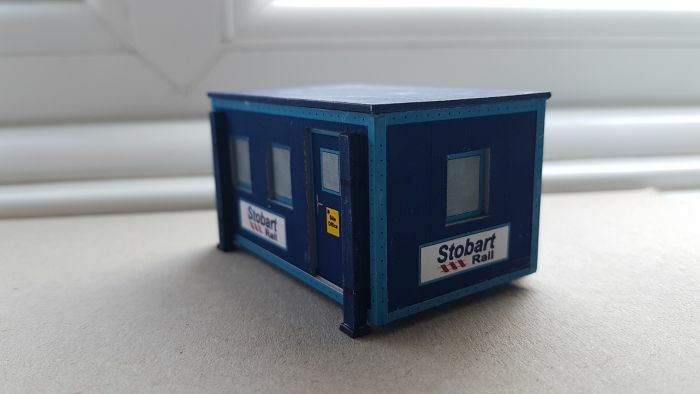 So you may not be aware I started a new YouTube series on card kit building, the pilot episode was posted last week & seems to have gone down well with the emails I've received, in the pilot which sadly is split over 6 short 15min videos sshows me building the Stobart Rail Port-a-cabin. The next episode due will be me building the WMR platform kit, this kit I've picked as I've recieved quite a few emails asking for this one. Also planned will be the new single garage kit / lockup units. After that I may attempt a more complex kits the new corner shop / building which will transform the WMR terrace row kits. So lets have a look at this new single garage kit / lockup units. 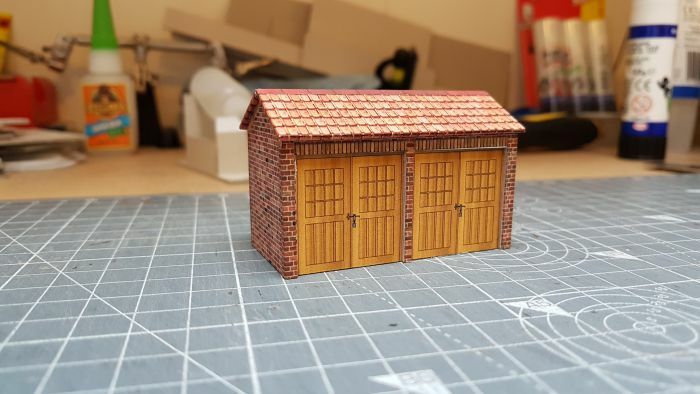 Basicallly it's an update from a kit I designed to be built using 300gsm card, now adapted to 1mm card stock to fill a space on my own layout. 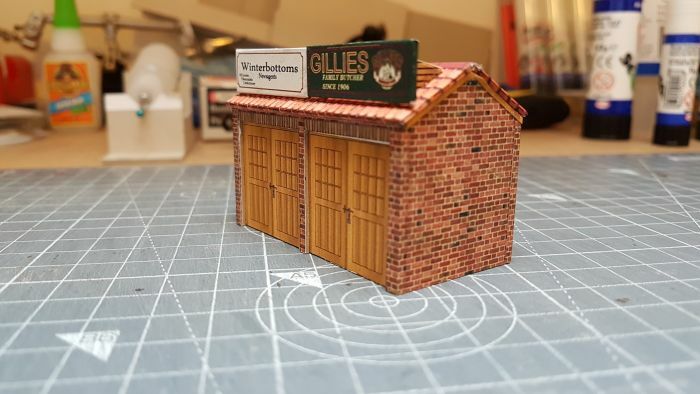 Here is the kit when converted as a large lockup unit for use by local shops on your layout. I then found the kit above was too big for the area on my layout, so with a little tweak I came up with this version, double width half size. Then if we add the signage they because very good shop lockup units. Stobart unit now joins the other two kits. Well time for me to go again as I'm now going to update the website with these new goodies. Remember I'm also going to update the Murphy & Network rail port-a-cabins today so you have the option to build all three without signage / logos. 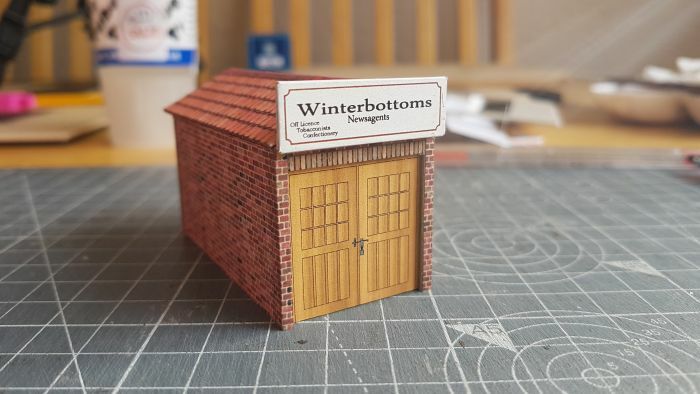 Now you'll be able to use these kits for anything you may dream a use for, tea rooms, hire shops etc etc. Beautiful. 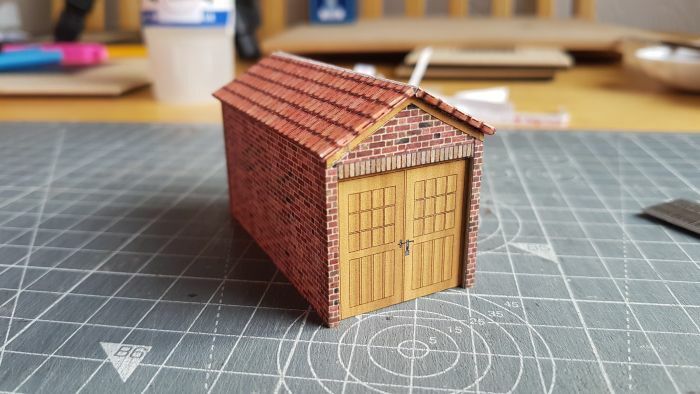 I'm not completely sold on some of the earlier card models on that site (brickwork looks a bit odd to my eyes), but that garage looks lovely, as does the portacabin. I love the locks on the garage doors, nice detail! I can't say I am a fan of card buildings, I built a lot when I was young, but these days I prefer the relief surface of plastic. That's not to say that they are not better than plastic, when viewed further away. The best I have seen, have been ones made by individuals by them taking their own pictures. There are a number of individuals out there who have had a go, then gone commercial and produce comparative rubbish, that even I could beat if I put my mind to it. Some are much better and I would put Mike in the top echelon, but considering he does it for free, no one stands a candle against his quality and cost! I am waiting for the half relief factories!